Practical wisdom from real estate and technology entrepreneur / investor / Near.biz founder, Samir Shaikh. Samir Shaikh, born to a middle class family in Pakistan and currently running several businesses (real estate, technology investing and his most recent start-up Near.biz) from his Palo Alto office since immigrating to the US in 2000, is embodiment to this immigrant ingenuity and success. When I first met Samir and we started talking about joining his start-up, two things about him stood out: 1. He has little interest in what companies can do or produce or make; what motivates him is how they can truly solve eveyday problems and have a real impact on the world (more on Near.biz later). 2. Like everyone within a 50 mile radius to San Francisco or Palo Alto, he wants to change the world; unlike most founders, he has a plan to do it (as he had done with starting past companies from nothing). Learn from his successes, failures and why Near.biz could be the next start-up that changes your life through this fireside chat. 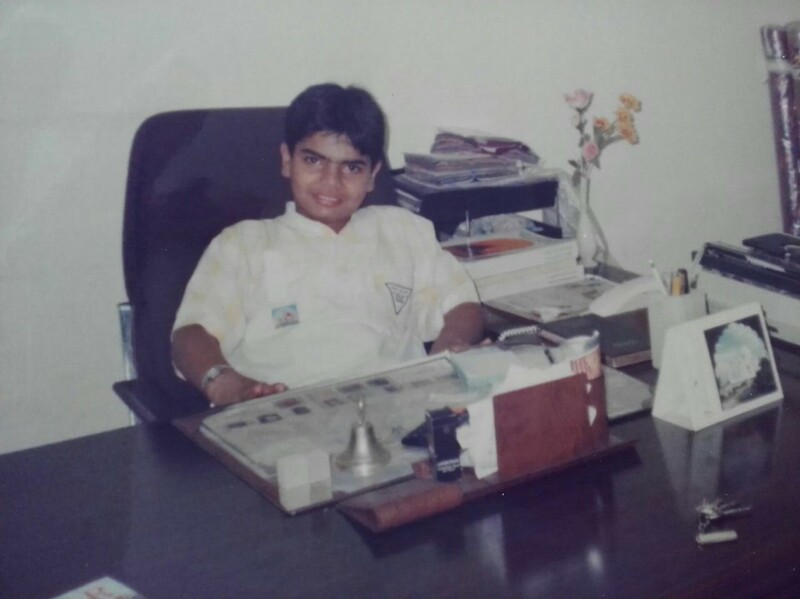 Born to a serial businessman who saw only opportunity and not the hard work and failures in establishing a business. A big part of childhood spent with the family travelling by road between Dubai and a small town of Al-ain shuttling products from the suppliers in Dubai to my Dad’s retail shop. Solving math riddles with my father and siblings all along the road trip. 2. How was your temperament growing up? Ambitious? Motivated? Different? I was always kept an arm’s length from the daily business routines so I can go to school, always sheltered, always peppered with hunger to succeed, using gifts and daily privileges in a middle class family. Always fed to become full of belief in myself. My mom tells me that I would pick fights with bullies larger than me. Well, I did it even if I got hit. 3. Any major life events that impacted you growing up. 3- At 21, just out of school, raising money for a business to the tune of 20 years of income and it blew up which led to the darkest moments of my dad’s trading business that pushed us 50 years in debt with no money to meet day to day expenses. Promising my parents and siblings at a very emotional moment to keep the faith by saying that “please believe that I’ll make this right”. After making that promise I fretted about the how for the weeks and months following that. In a third-world country creditors are not civilized, and there’s no chapter 11 unfortunately. They are sharks circling the prey but we survived. I want to write a book about this experience for anyone who’s run into a hopeless situation. 4. How did you get to Silicon Valley from Pakistan? A now famous college professor of mine in the Silicon Valley hired me here to help run his startup. I got included into the top management within one week of showing some of my chops. Worked two jobs for about a year until the Dot Com crash 1st) to pay the bills and the debt 2nd) to feed my hunger to succeed experimenting new ideas. Started paying off creditors and saving amazing amounts of money. Executed by maximizing present income by holding onto a well paying job, and experimenting with idea companies. Stayed out of debt, a $800 car was ok for me even when I was young and making a 6 figure salary. I was mocked. I started buying real estate with my father when I was 23. I purchased my first home in Silicon Valley at 26 (before getting married). Gradually building up step by step to the real-estate crash in 2008 and then invested everything into that perfect storm?—?that really paid off. Quit my job to do my second startup with a college friend when Barack Obama became president, naively exuberant about possibilities. That startup failed too and I was broke. 5. How does it feel to be an immigrant founder in the Valley? 4- You have lots of advice on what not to do?—?while what you seek is what to do and how. 6. How has non-US roots helped you find success in the Valley? Was it an advantage? 3- From execution standpoint it is a major disadvantage, and as a result many incredibly smart people end up playing small league all our life. 7. Were there times in the corporate world or real estate business or tech entrepreneurship when you rebelled against status quo? 1- At GE Digital, I had discovered a technology to challenge the big league Tech players (Apple & Google) on their game. I fought all the way for my project, rebelliously, pleadingly, completely mesmerized and blinded by what I was seeking. 2- At Cisco, I started trying to solve our product line’s long sales cycles by adding unconventional use-cases and experimenting. It wasn’t my job, but I wanted to help. Generally speaking I think large corporations are awesome for learning and the ones I had the privilege to work at really feed your hunger. There is 99% opportunity everywhere. There comes a time when you rebel when your ambition loses its top bounds. It just happens. 8. When did the mission to start the Internet for Everyone come up? How did it manifest? After GE Digital working on Predix, the awareness sunk in that the technology world is changing very rapidly and a workforce platform could be a major contribution. I starting putting my savings into the idea when I saw the Near.Biz business model could help supplement how we raise our kids, run our household, automate our real estate business, automate our diabetic testing business, and be a desirable mechanism for ourselves to work and grow our own careers. When we saw so many use cases and a common theme around the solution, we decided to see who else might be interested. And we did find amazing opportunities, some supporters and a few selected team members who would work together on this. If we are able to map our technology to the workforce problems at a large aggregator?—?that is where Near.Biz will spring board out and make a massive contribution to everyone’s lives. I really want this to become how my younger teammates work in their life, and my kids work. 9. What vision of the future do you see? If you look 10 years out service delivery will be much more in real-time. Lots of recent laws and some in the works may make flexible work a viable alternative to today’s full time jobs. Further I think the business models we are pioneering around open and connected in the hiring industry are at the cusp of taking off, and the Internet will become more centered around how people work, play, and learn?—?this is what we call The Internet for Everyone. We believe we will get a lot of traction as we get our message out. We are completely focused on the experience we want to give to our customers, partners, and team members.